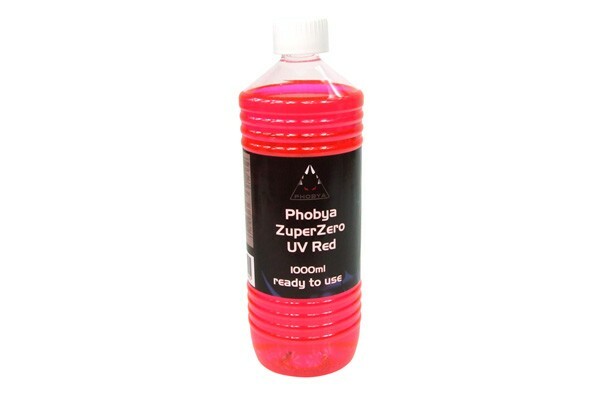 Phobya's coolant series was specially designed for use in PC watercooling systems! Phoba's developer's years of experience in the watercooling sector have resulted in this mixture which features all the things one could ask for in a watercooling system: Corrosion protection, algae suppression, protection from disintegration of different metals as well as extremely low electrical conductivity. Of course plastics such as PVC, NBR, Acetal, Plexi etc. will not react with this coolant. But only the functionality was considered, the coolant is also available in different colours . Some of the Phobya coolants have special features. This coolant is not only red, it is also UV-reactive, lighting up when exposed to the light from an UV LED, Flexlight or cold ligth cathode. This coolant is a ready to use mixture which means that it can be added to the system directly without being mixed or diluted. As this coolant contains dye it cannot be guaranteed that it will not stain e.g. clothing or other materials when coming in contact. Please also note that dye fades with time and the intensity of the colour may decrease.